Raising babies is usually not a problem as normally the parents do all of the work. You need to provide them with a nest box and suitable nesting material. I usually place some nesting material in the nest box and then provide more on the cage floor. This allows the male to pick up the material and take it to the female sitting in the nest. This material should include small round pieces that the baby bird can grasp with his toes. This prevents the legs from spreading out sideways making it impossible for the baby to walk. You also need to provide them with food, grit, and water or they will not stay in the nest on the eggs. The birds usually lay two eggs, two days apart. Once the baby has hatched it will begin to soil the nest with its stools. Most diamonds will then want additional nesting material to cover the old, dirty material. Often new birds will sit on their eggs for a few days and then abandon their nest. If that is happen you can place the eggs in the nest of some older birds if you have any or you can try to incubate the eggs and raise the babies yourself. See below. I have found that the parents that have abandoned their eggs will soon mate and lay another set. After one or two starts they will usually settle down and stay on their eggs throughout the incubation period - as long a food and water are available and they are not badly frightened or otherwise disturbed. The first of the two eggs will hatch in about 14 days (13 to 15 days) and the second egg will hatch between 11 and 12 days. You will know when they have hatched because you will find broken egg shells hidden somewhere in the cage. It is then very important to see that the birds are not frightened as if they move around suddenly in the nest they may step on a baby and kill or maim them. Never pick up a parent bird at this stage to see the babies. After a week, the babies are much larger and much of the physical danger to them has passed. They will fly before two weeks and then the parents try to persuade the babies to feed on their own. Once the babies can peck their own seeds, they probably should be removed from the parents' cage. However, I have occasionally been able to leave babies in the parents' cage and I have even seen a baby bird sitting on the eggs with their mother. Recently we have had several babies stay in the cage with their parents until the next clutch hatched. You need to watch this situation carefully, though, as the parents may all of a sudden decide they have been around too long and attack them. People often ask me what they need to do when their diamonds are about to hatch out their babies. I would suggest that they obtain some baby bird formula in case supplementary feeding is needed. See the paragraph titled Emergency Baby Feeding near the end of this page for instruction on feeding and formulas. I usually recommend not disturbing the babies for the first week. But keep an eye out on the cage floor as if babies are two weak to feed they will sometimes throw the baby out of the nest. If you find a baby on the cage floor that is cold but still alive, he immediately needs to be warmed up. You can hold the baby in your hands under a light bulb that generates hear until his body is thoroughly warmed. Of you can very carefully immerse the baby in warm water and hold him there keeping his head out of the water until his body is thoroughly warmed. Then you can blot off the water with a soft paper towel since he will not have any feathers and then hold him under a lamp until he is absolutely dry. Then see the emergency feeding of babies section below. Once he is fed and his crop is full you should be able to return him to his nest and the parents will usually take over. You should try to look at both babies from time to time time see if their crops are full. See the photo below to see what a full crop look like. Often the baby that hatches out second does not get enough food and may die without supplemental feeding. Experienced parents avoid incubating the first egg until the second egg hatches so it will hatch at about the same time as the second egg. Then the babies will be nearly the same size and able to compete for their parents food on an equal basis. A consistently empty crop after day 2 - 3 requires removing the baby and providing supplemental feeding, When you remove a baby from the nest for supplemental feeding it may be best to deftly lift the parent completely off the nest so they do not try to fight you and possibly injure the babies in the process. People often write in and ask why their new doves have not mated, made a nest, and laid eggs. Doves that have been recently moved from one location to another are under a considerable amount of stress. Before they think about bonding, mating, nest building, etc. they need to recover from the stress and feel that they are now living in a stable environment. This could easily take one or two weeks or more. If the birds were not bonded prior to the move, it also may take some time before bonding will happen. 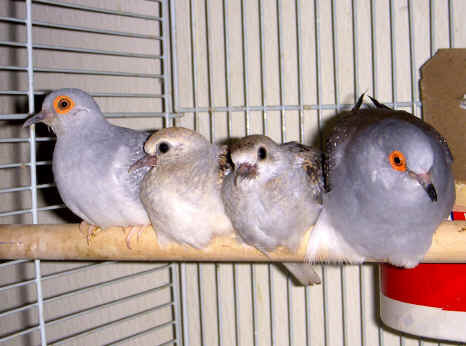 In most cases bonding will probably take place in lest than a month, but I had one pair that was living in a cage together take six months before they mated and eggs were laid. I also had a handsome male wait two years before he finally selected a suitable female out of those that were available. The best solution to many of these problems is simply to have the patience to allow the doves making a family on their own time. Below is a summary of the most common problems. Sometimes homes have low humidity levels and if steps are taken to increase the humidity around the nest then often the eggs will hatch. Poor lighting may have an effect on incubation. Some species place their nest in a location where it will receive a certain amount of sunlight during the day. Other than the above the only other thing I know of that can be done is to be sure the birds have quiet, stress free environment for egg incubation (see below). The nest box is not located where the doves want it. Doves will often lay their eggs inside a seed cup rather than in the provided nest box. Why they do this is a mystery to me. To correct the process we have found the following procedures usually work - perhaps only after several tries. Be sure the nest is mounted on the rear cage wall (opposite the door) at a height that is just below the height of the top perch. Be sure the nest is located where bird sitting on the perch will not drop stools into the nest. Provide nesting material on the cage floor (remove any grate - they are not suitable for doves). Also provide a little nesting material in the nest. 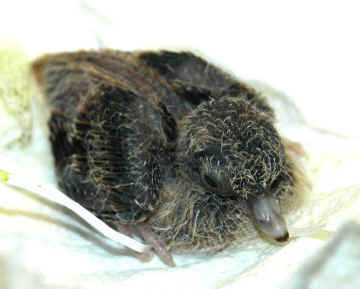 If the dove refuse to incubate the eggs leave the eggs in the nest box for 14 days and a few more before removing them. Mark the first two eggs with a felt tip pen so they can be removed if the hen decides to lay a second clutch in the nest. As I remember these procedures worked sooner or later with all out dove that started off laying eggs outside the nest. There are a number of reasons why a diamond pair will not incubate their eggs continually from the time an eggs is laid until the babies hatch out. 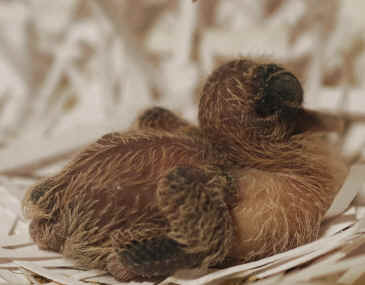 First it is normal for the eggs to be incubated from the time the second egg is laid until the babies hatch out. Young pairs may incubate their eggs from the time the first egg is laid but I have found that after a few clutches the incubation will be started once the second eggs is laid. This is to insure that the two chicks will hatch out at nearly the same time and will this be of nearly the same size. Otherwise the bigger chick will always get more of the food and the smaller chick may starve to death. If the second chick's crop is rarely fully inflated then supplemental feeding is recommended to help him survive. Normally females will incubate the eggs during the night and most of the day. Males will switch off with the female at various times during the day so she can eat and rest. Both males and females will incubate the eggs at the same time (double nesting) during the last few days so that higher humidity and temperature levels are maintained. Below is a list of reasons why the eggs may not be continually incubated from the time the second egg is laid. The male refuses to stay on the nest during the day so the female as time to get of and eat and rest. There are other reasons for eggs that are not fertilized. The chart below summarizes the possibilities. Correction of any of last six cases requires the identification and replacement of the bird that is infertile. There are other possibilities including fertility changes with age. Females can only produce a finite number of eggs. When the supply is exhausted they will not have any more eggs. It should be noted that females can be stimulated by a close relation with a human and they will produce two infertile eggs. Birds can not distinguish between fertile and infertile eggs, so they incubate infertile eggs for the same time they will incubate fertile eggs. My feeling it is best to let them remain on the eggs for the full 14 days because then the female will not lay new eggs but once every three weeks or so. If the eggs are removed from the nest, the female could have new eggs every three or four days. This high level of egg production could be damaging to her health by lowering calcium levels in her body. I would not remove the eggs in these situation until the birds abandons the eggs and this may be several days past the normal 14 day incubation period. 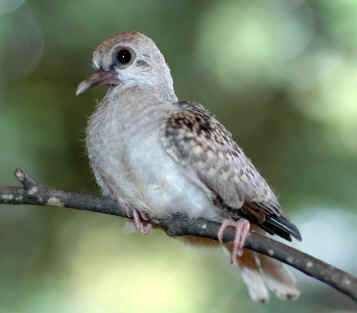 Diamond doves normally lay the first egg of the next clutch when the current baby is about 13 days old. Since it take about two days for an egg to be formed, this means the male will often start courting the female when the baby about 10 or 11 days old. Sometimes the female may prefer to delay the production of the second egg feeling that the current baby/babies need the parents full attention. Charlotte Van Hoozier's data indicated the first egg of the new clutch may be laid anywhere between an age of 10 to 16 days age of the current clutch but the average age was 13.2 days. If the female prefers to delay the first egg of the next clutch she may have a disagreement with her mate that could result in fighting. If you can not convince the male that his mate may have a valid reason for delaying the first egg of the next clutch, then I would suggest the male be removed form the cage and placed in a spare cage and getting the female to take care of the babies. Then from time to time put the male back in the main cage and place the female in the spare cage. Thus the female gets a chance to rest, eat, and drink and the male can use his food to feed the babies. Do watch the babies crops to be sure they are being fed enough. If not you might want to consider supplemental feeding. After a day or two you can return the male to the main cage to see if the two will have a meeting of the minds regarding this issue. First it should be noted that a baby sometimes appears on the floor of the cage, not because the parents threw the baby out of the nest, but rather because the baby accidentally fell out of the nest. This could be because the parents accidentally pushed the baby out, the fact that the wall of the nest box was too low, or because too much nest material was placed in the nest box. Sometime the parents get carried away when they really like the available nest material. In any case the baby should be warmed (if cold) (see below) and returned to the parents. Of course a new nest box may be needed or some nesting material may need to be removed from the nest box. Old time breeders often say that the parents remove baby birds from their nest when they believe the babies are somehow defective, perhaps in ways that we can not perceive and will never grow up to be productive adults. Thus the old recommendation is to accept the parents' verdict and not waste time trying to rehabilitate these chicks. Over the years we have experienced a number of these situations and have found the most babies are thrown out of the nest because they are too weak to hold their heads up to feed. We do not have any information why this is the case. In more than 20 years of raising diamonds we only had two cases where chicks were tossed out for other reasons. One bird was an albino and in the end had poor vision and could not fly and another was a dark colored silky bird that also could not fly. No matter what the reason the birds was thrown out for, if we found it before it became cold and died, we were able to warm and hand feed the bird and then either return it to its parents or if rejected again then hand feed it until it was able to peck seeds. See the "Emergency Baby Care" and "Emergency Baby Feeding" sections below for instructions for caring for such a baby. If the baby that was tossed out has become very cold before you found it, do not give up without trying to warm it. The fastest way to warm such a baby is to immerse it in a bowl of warm water having a temperature of about 110 degrees F - slightly higher than the bird's body temperature. Hold the baby in your hand keeping its head out of the water and wait until you see considerable movement. Recognize you want to warm the entire body not just the skin. After you are sure it is sufficiently warm, then remove the bird from the water and quickly dry it with a soft paper towel. (If your are rescuing a older bird with feathers, the drying process will take much longer and may be facilitated by using a hair dryer). Both the albino and the black feathered baby survived hand feeding and each lived for more than a year. One was killed by sleeping in someone's bed and the other died after going on a 1600 mile automobile trip - causes not related to their "birth" defects. Some people have sent in messages asking about what they can do if the parents abandon what appears to be a perfectly good set of eggs. If the parents do not return to their nest within a day or two, I have taken the eggs and put them in the nest of another pair, and often they will sit on the eggs, and if they hatch, the foster parents may raise the babies. If they refuse then we have taken over the feeding process and have successfully raised a number of babies ourselves - we have also lost a few. If you do not have any foster parents, you might attempt incubating the eggs. I have never had reason to do this my self so the following is not based on personal experience. Danny Brown (1) in his book "A Guide To Pigeons, Doves, and Quail" recommends a temperature of 100 degrees F (37 degrees C) and humidity levels between 55 and 60 percent. A thermometer and hygrometer are necessary for the accurate measuring of temperature and humidity. If you have a poultry incubator it can probably be set to these settings. Otherwise the eggs need to be placed in a box with a lamp that can be raised or lowered for temperature control and one or more bowls of water for humidity control. The eggs need to be placed in an egg carton or something similar and stood up so the narrow tip is pointing up and the axis of the eggs is leaning against the side of the egg carton at about 45 degrees. The eggs should be rotated 180 degrees left to right in the morning and 180 degrees right at night. Incubators may turn eggs up to 25 times a day but it is felt that turning them twice a day may be adequate. Danny Brown (1) maintains that egg turning is essential for the normal growth and development of the embryo. It should be noted that eggs that are abandoned after laying, can be kept about five days before the probability of hatching starts to decrease. Adequate hatching can be obtained with eggs that are up to ten days old. In both cases eggs should be kept in a cool dry place, stored pointed end up and turned twice a day, once to the left and once to the right. Eggs may be kept longer it stored at a temperature of 55 degrees F and are wrapped in plastic to minimize the loss of moisture from the egg. When the babies hatch out they will be very tiny, blind, and without feathers and should be kept warm at a temperature of 95 to 96 degrees F (35 to 36 C) (1). As the birds feather out, the temperature can gradually be reduced to the high 80's. 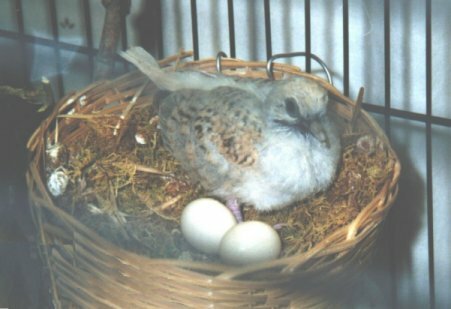 You should place the babies in a nest box complete with adequate nesting material (See the "Caring for Diamond Doves" page). Do not place small babies on smooth surfaces and if you remove a baby from its nest, be sure the baby's legs are kept underneath their body and not allowed to splay outward. The nest box should be placed in a large cardboard carton to prevent drafts. A desk lamp with an adjustable neck should be placed in the carton to provide heat in the nest box, The distance between the lamp and the nest box should be varied to obtain the proper temperature. The correct humidity can be obtained by placing a bowl of water in the carton adjacent to the next box. A thermometer is essential to be sure the temperatures stay within the the prescribed limits. Be aware that because of temperature changes in the room during different times of the day, the nest temperature must be checked frequently and the lamp adjusted as needed. An alternative heating source could be a small heating pad placed underneath the box, wrapped in a towel if necessary. After hatching babies can be fed using the techniques described in the section below. WHEN FEEDING IS REQUIRED: Sometimes parents will remove babies from their nest during the first two or three days after they hatch out. Many say such babies are tossed out because the parents know the babies are defective and will never become healthy adults. My experience indicates this is not true most of the time. Again and again I have taken a nearly cold, nearly dead baby from the cage floor, warmed it, and then fed it with baby bird formula, and the bird survived. In most cases I was able to return it to the parents nest and the parents gladly took over the job of feeding the baby. Other times I was able to get a pair of foster parents to take the baby in when the original parents refused. And once in a rare while I have had to feed the bird until it was able to peck seeds on its own. Other times the parents will not remove the bird from the nest but will not be able to feed the baby because it is to weak to stick its head up to receive food from the parents. So it is worthwhile to watch and see the the parents are able to keep the babies crop full. In watching the babies I try to get a glimpse of the baby without physically removing the parent from the nest as the baby might be hurt if the parent tried to resist my efforts. But if I find the babies crop is empty or find the baby laying over on one side, then I remove the parent, take the baby out and feed it until it appears stronger. At that time I return the baby to the nest and the parent almost always will take over. FORMULAS: Some of the possibilities for baby bird formula are listed below. Undoubtedly there are others. The important consideration is that the squab milk given by the dove parents to their babies include higher levels of protein (11-23%) and fat( 6-12%) than are needed by other birds. The best formula for feeding baby doves is probably Roudybush's Squab Formula. However it is expensive and hard to find. Some websites provide for purchase and it probably could be obtained by express mail if needed. Kaytee's Exact can be obtained from most pet stores and is easy to use While this formula was not developed for doves, it seems to do well for supplemental feeding and we have also used it successfully for complete feeding from day one until the baby started on seeds (Kashmir). One advantage of the Exact formula, it allows the use of hot tap water and thus no cooking is required. Also the birds is easily cleaned using a little warm water. Other alternatives include the use of Purina's Mazuri Parrot Breeder and Pedalyte. The pellets are soaked in hot water and dissolved in Pedalyte. The mixture is then cooked on the stove to obtain a smooth blend. After cooling additional Pedalyte is added to obtain the correct thickness. The same technique is used for the monkey biscuit alternative or the emergency dog food alternative. You can also use some of the Gerber's baby formulas such as their High Protein Baby Cereal or others that include wheat without fruit added. In all cases the young baby needs a thin runny formula which is gradually thickened as the baby grows. The Exact formula starts off with one part of formula to six parts of water and decreases two two parts of water at weaning. FEEDING METHOD: There are many different methods for feeding baby birds and there are many opinions as to what is the best method. Others like to use syringe or fine eyedroppers to place the formula in the babies beak. I prefer to feed the baby directly from a very small plastic spoon. 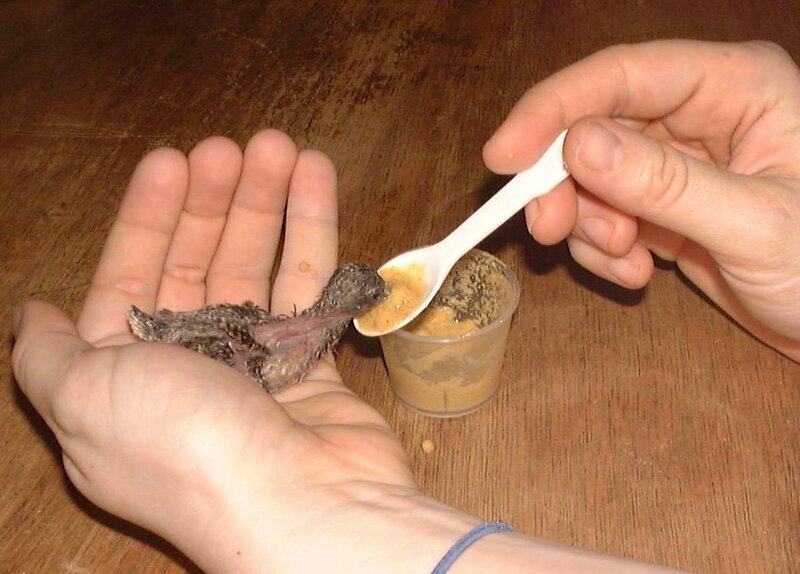 I prepare 1/4 of an ounce of formula in a one ounce plastic measuring cup, take the baby in my left hand and then take a spoonful of formula and dip the tip of the baby's beak into it. Some seeps into its beak and usually when it tastes it and feels the warmth, the baby will start to lap it up on its own. The amount consumed is small and the time it takes is long in the beginning. If the baby starts to wave its head around as a soon as it touches the formula it may be too hot. The formula should not feel either hot or cold when you apply some to the inside of your wrist. If the feeding process lasts too long then the formula will be too cold and it is best to prepare a new batch. Recognize that it may take considerable patience before a new baby will eat much but after the first few hours things should go much easier. Babies that are three days old may drain the little spoon in a second and then I simply feed them directly from the measuring cup. Sometimes you need to be careful that they are not so eager that they thrust their whole body into the cup. WATER: Do not give a baby bird water. It obtains all the liquid it needs from the formula. (unless you made the formula to thick for the birds age - see the directions on the formula box), Once the bird is on a seed diet then water can be provided. FEEDING TIMING: Once a baby has eaten it will usually fall asleep until it becomes hungry. If you are not returning the bird to the nest, be sure that the baby is kept in a warm, draft free environment, with a temperature of 96 to 98 degrees. Once the crop starts to appear deflated the baby should be fed again. Feedings will be frequent the first day - perhaps several time an hour, but then they will taper off as the baby becomes larger. FEEDING AT NIGHT: Some say you do not need to feed babies at night as parents normally do not feed at night. But for the first two or three nights we have fed them up to midnight and then got up two or three times to see if they were awake and if they were we have fed them again. ADDING SEED TO THE DIET: After a week or so you should attempt to add seed (finch seed for wild birds) to the formula and eventually the seed should completely replace the formula. When the feeding becomes less frequent than three hours, bird seed should be added to the diet. I have always used finch seed for wild birds. This seed can usually be purchased from big box stores like Lowe's or Home Depot in five pond bags.. You may be able to mix it with the formula you are using. However lately I have found once the bird is ready for seed, he or she will often refuse the formula. Then one must open the bird's beak and drop some seed inside. To open the beak I use my fingernail or apply gentle pressure with two fingers, one on each side of the beak. I then pick up seeds with three fingers of my other hand and pour the seeds into the open beak. The bird's head can then be released so he can swallow the seed and the process can then be repeated. I hold the bird over a small tray so I can collect the spilled seed. You can also try using a syringe where the tip has been cut off at a diameter that will allow the seeds to pass through the opening. Or you can completely cut off the nozzle of the syringe, insert seed, and then wrap a small piece of cloth around the opening using tape. Make a hole in the cloth for the birds beak. Others put the seed in the finger of a rubber glove and get the bird to get the seed by pushing his beak through a hole in the tip of the finger of the glove. Getting a bird to eat seed for the first time is difficult, but once you find a way that works for you, repeating the process becomes easier. Once the bird has started to accept seed, and I often place the baby in a seed tray where older birds are pecking the seed. Eventually the baby will imitate the older birds, but it may take several days. And at first, although the bird pecks at seed, the baby does not roll the seed up its beak and into it's mouth. That will take another day or two. When you do not have other doves to sue as trainers, another method to get babies that are used to eating seed to peck seeds on their own is to lay some newspaper on the floor with seed scattered on the surface. Then with the baby standing on the paper, tap the newspaper making the seeds bounce up slightly. The bouncing seeds may cause the baby to try and peck at them after some time. The babies should be fully feathered within a week and in an average of 11 days they will leave the nest during the day and sit on the perch to sleep at night. Babies that are still on the floor at the time the lights are turned out should be returned to the nest. It is often interesting to watch the family members jockey for position in the evening. The male will be sitting on the perch and the female will come to sit beside him. Then the babies will try to get in between the male and the female. Then the female may move to the other side of the male. Then the babies will switch again. And this goes on and on. Usually it takes a week after they leave the nest before the babies will be pecking seeds on their own. If we are hand feeding the babies we just stop feeding the them for a day and see what happens. Then if necessary we will feed them again and repeat the process. Eventually the parents will feel that the babies need to leave their cage and go live on their own. By this time the parents probably have already laid the eggs of the next clutch. The matter is usually precipitated by large babies continually pestering their parents for food even though they are fully capable of eating on their own. At an average age of 19 days, the parents will attack the babies when they begin to beg. At this point the babies should be removed an placed in a separate cage. Of course some babies need to leave a few days earlier and others can stay in the parents cage for a much longer time if they are smart enough not to ask the parents for food any more. And if they volunteer to help with egg incubation that may also be a factor in their favor. But in any case the youngsters should be removed before the new babies hatch. Such babies can be kept in a "baby" cage for about three months with other babies. After that they will be sexually mature and will show interest in mating with each other. (5) Cooper, Jo, Handfeeding Baby Birds, Neptune City, NJ: T.F.H. Publications, Inc., 1979.